Eek! How Did I Ever Live With an iPhone 5s? It didn't take long. Right after I reviewed the Amazon Fire Phone, I knew that the 4.7-inch smartphone size would be perfect. Handling an iPhone 5s confirmed the diagnosis: How did I ever use such a small iPhone? Here's what happened. Back in August, I saw the handwriting on the wall. "Looking Back at Our Ridiculous 3.5-inch iPhone Displays"
The Apple community had pretty much sized up the idea that Apple would come out with 4.7- and 5.5-inch models, and Amazon saw no point in bucking the trend towards larger smartphone displays. The Fire Phone launched with a 4.7-inch display and not only did I fall in love with the form factor, but I found the Fire Phone itself pleasant to use. It's too bad Amazon hasn't sold more. But then, the Amazon emphasis was on gleaning what you might want to buy from them instead of a fanatic focus on customer privacy as Apple has done. I submit that Apple has made exactly the right choice with its two iPhone 6 sizes. After using my iPhone 6 for only about three weeks, I was shocked when I recently handled my wife's hand-me-down iPhone 5s. I needed to take some photos of my iPhone 6 in a case for a review, and it's more convenient than using my iPad Air's camera—with the case I have on it. The 5s felt like an ancient toy from a dusty drawer. How did I ever use an iPhone 5s? I wondered. It looks pitifully small. Of course, I know the answer. 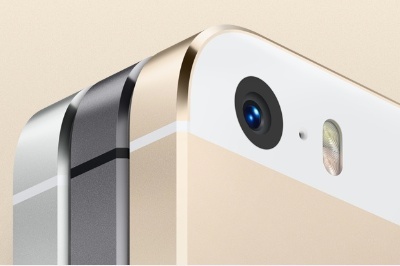 One gets used to a certain size after a few years of iPhone 5, then iPhone 5s at 4.0 inches (diagonally). So why didn't I go for the iPhone 6 Plus? First, I like to use a belt holster, and I felt that a giant-size 6 Plus would be awkward. Second, the iPhone 6 will get handed down when the iPhone 6s comes out. A Plus is too big for my wife, she announced. The bottom line is that for all those years, we, meaning me, made fun of larger Samsung smartphones and phablets and declared that the human thumb rules. We must be able to operate the iPhone with one hand. And then, when the larger iPhones arrived, with a few concessions to one-handed users, I saw saw how silly I'd been. It's amazing how the Internet can create a thread of thought that influences our thinking. Then, when the reality sets in, we realize that there is something called objective truth. A larger iPhone is essential nowadays considering what we try to do with it. It's amazing how long it took for all of us, especially me, (and likely Apple) to realize it.